If the AC unit isn’t spewing out cold air when you turn it on, you need a professional Charlotte AC repair company to take a look at it. There are many different things that could cause your unit to malfunction like this. It could be as simple as wiping off a dirty piece or as difficult as a broken one that needs to be replaced. 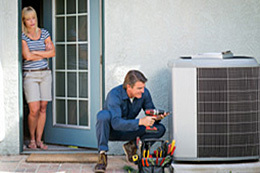 The point of getting an AC is to keep the home cold – but watching your AC unit freeze itself is ironic and annoying. When the unit freezes, you run the risk of having some electrical problems, so it’s best to turn it off right away and let it melt. Sometimes this may be as simple as wiping off a dirty filter, but you may need to call in the Charlotte AC repair company to figure out if it’s anything else, like broken coils or short-circuiting pieces.